With summer here for the boys, I always like to find fun activities we can do as a family, that don't necessarily involve a water slide, roller coasters and junk food (though we do some of that too). This year, we decided that we are going to bake cookies.....lots of different kinds of cookies! I've got this great cookbook called The Bake Sale Cookbook that has the BEST banana bread recipe ever in it, I use it ALL the time. I've always wanted to cook my way through a book, and this one has lots of tasty sounding recipes... so we're going to try it. 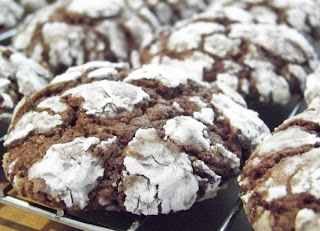 Our first selection is for Cocoa Crinkles, they use ingredients I have on hand, and seem simple enough to make. I'll let you know how they turn out tomorrow. Also on the books for me this week is some major scrapping! I'm designing a new workshop and making kits for it too. If you're coming to Croptopia Pink, you'll be able to sign up for the class - Summer Fun! A 10 Page chipboard mini album showcasing Top 10 things you did and loved this Summer. Featuring the We R Memory Keepers Mini 4x4 Chipboard Album, 10 mini page protectors, Basic Grey June Bug pre-cut papers, and embellishments along Stix 2 anything Glitter and Seed Beads, Prima marketing ribbon and flowers, custom made transparencies, stencils and journalling spots, and Prism Cardstock. This is going to be a GREAT workshop and kit! Can't make it to class? 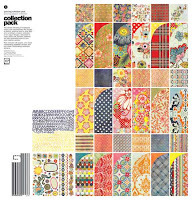 You can BUY the kit, inlcuding FULL colour instructions and all supplies for just $30.00. who is raising funds for the Weekend to End Breast Cancer. If you attend the class, you can buy additional kits for $24.95. I should have a sneak peek available tomorrow afternoon. NEED the collection pack? Pre-order it with me by sending an email, and I'll make sure to get yours in the next shipment I receive. Cost, only $22.00 + tax. Lara that is great that you are donating a portion.. what a great idea!